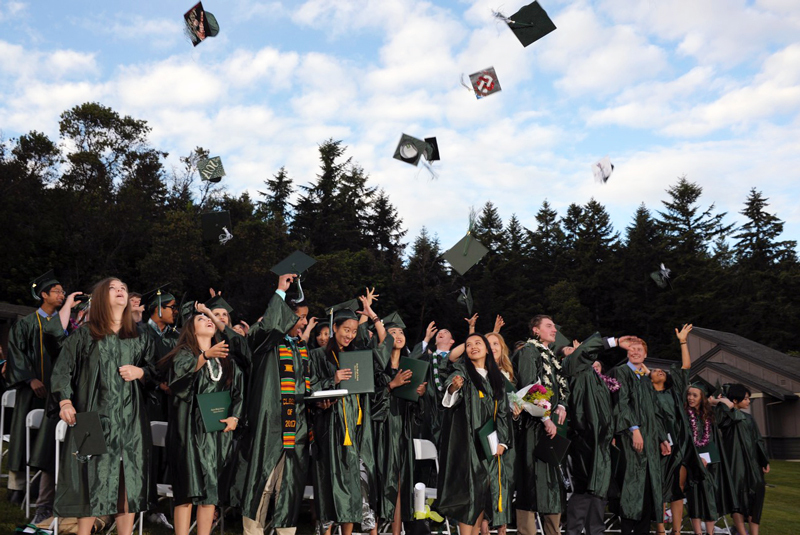 Tacoma, Wash. – The Class of 2017 graduated from Charles Wright Academy on Saturday, June 10, in an outdoor commencement ceremony on the lawn between the Lower School and the Upper School. Seventy-four seniors received their diplomas, each from a faculty member whom they personally requested to present the honor. Upper School Head Bill White led the festivities alongside Head of School Matt Culberson and Board of Trustees President Joe Mayer. Outgoing CWA Chaplain Mike Moffitt opened the ceremony with an invocation before Parent Association Steering Committee Chair Jenny Unruh presented longtime Upper School math teacher Gil LeFrancois with the 2017 Inspirational Faculty Award. Founder and headmaster awards were presented to seven graduates: Wyatt Swift (Sam Brown Award), Ruilin Chen (Bradshaw Award), Madelaine Adams (Haertl Award), Allison Knowles (Havens Award), Dylan Sam (Sanford Award), Kate Pasco (Minnerly Award), and Kiana Taghavi (Camner Award). Upper School math teacher Leon Phillips was elected by the graduating seniors to give their commencement address, and class responses were given by Sophie Hinz, Wyatt Swift, and Kiana Taghavi. We wish this year’s graduating class the best of luck and look forward to welcoming their visits and celebrating their accomplishments with them for years to come. Congratulations, Tarriers! For select images from Saturday’s festivities, view the slideshow below. Photos by Brian Lee, Ben Reed, and Jasper Xin ’18.